In December 1912, a young man experiencing the onset of tuberculosis committed himself to Gaylord Sanatorium in Connecticut. The third son of a well known Irish-American actor, the young man had up to that point led a somewhat dissolute life. Brought up in boarding schools, he was suspended from Princeton University after his first year . By the time he checked into Gaylord he’d been a miner in Honduras, married (and abandoned) his first wife, spent several years sailing the Atlantic , and survived at least one suicide attempt. A change came when at the sanatorium he began writing plays. He was 24 years old. His name was Eugene O’Neill. Eugene Gladstone O’Neill, son of actor James O’Neill, was born on October 16, 1888 at the Barrett House Hotel located in what was then known as Longacre Square. The Barrett House Hotel is the distant building on the left side. It later became the Hotel Cadillac. James O’Neill was a dramatic actor known best for his role as Edmond Dantes in a stage adaptation of The Count of Monte Cristo. His declamatory style was in step with the kind of theater popular at the time: full of bold gestures, spectacle, and clear lines of morality. In May of 1913, after receiving a clean bill of health, the young Eugene took up play writing in earnest. He attended George Pierce Baker’s play writing class at Harvard University. 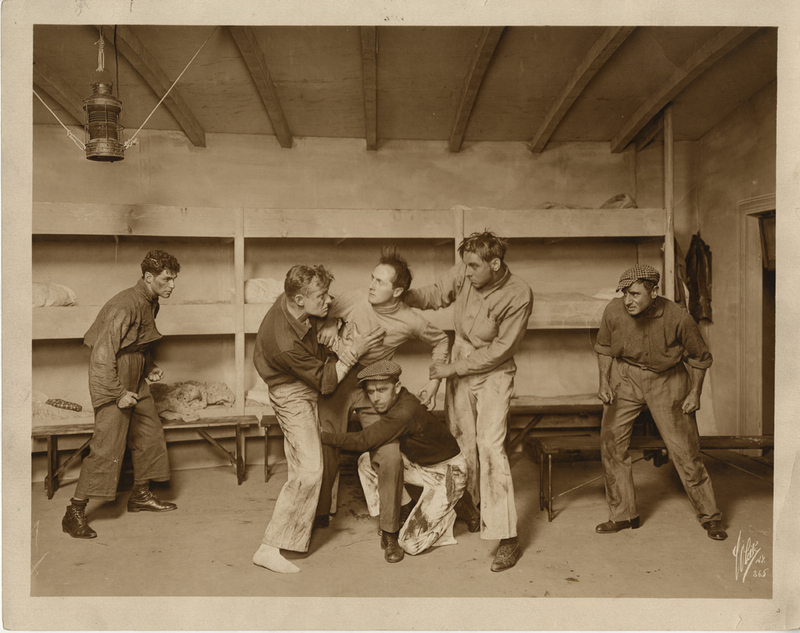 Sailing up to Cape Cod in 1916, he spent his first summer in the company of the Provincetown Players, a newly formed group of theatrical artists committed to working against the grandiose melodrama that dominated the American stage. It was at the Players’ Wharf Theatre that O’Neill performed in his own Bound East for Cardiff. (Shown on the far left in the image below). Bound East for Cardiff was the first in what would become the Glencairn Plays, so named for the fictional ship on which the one-act plays were set. 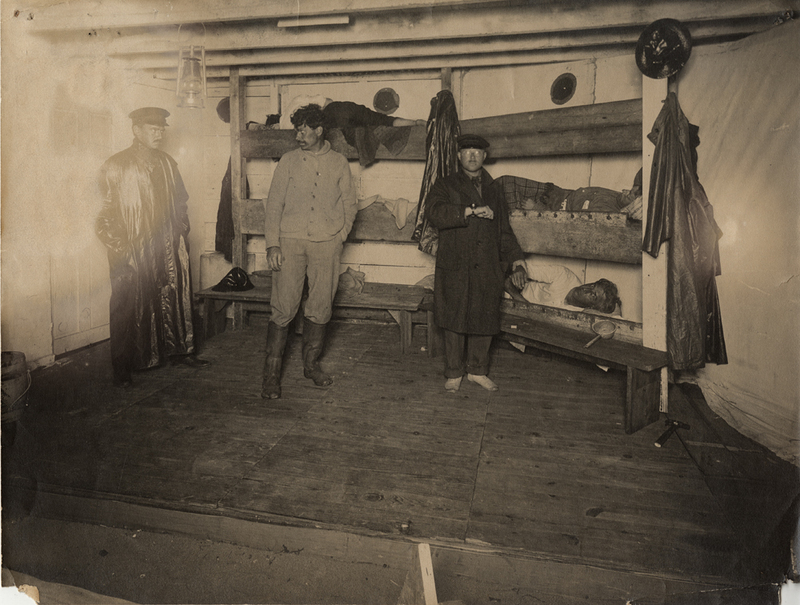 The S. S. Glencairn, its characters, and its journeys were inspired by O’Neill’s time aboard the British steamship S. S. Ikala. These four plays include Moon of the Carribees, The Long Voyage Home, and In the Zone. They focus on a group of sailors and what they carry: secrets, a longing for a different life, and sometimes a bottle of rum. 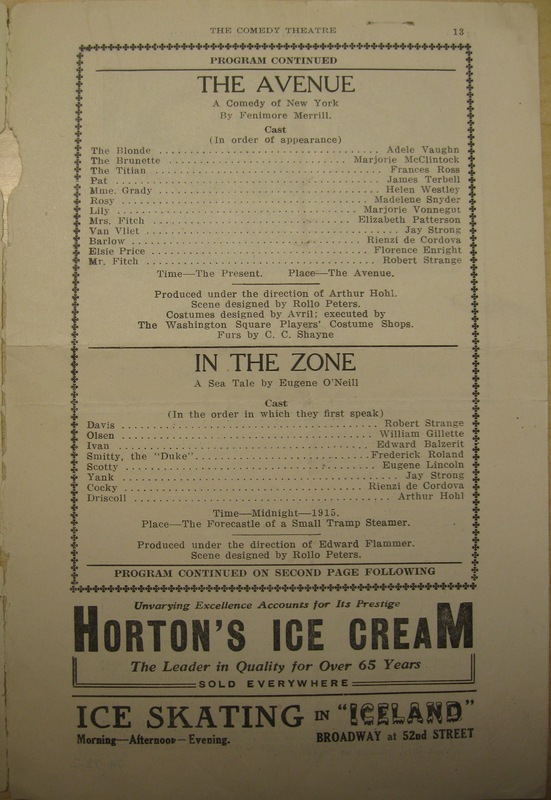 Though written second, In the Zone is considered the last play in the series in terms of the characters’ chronology. 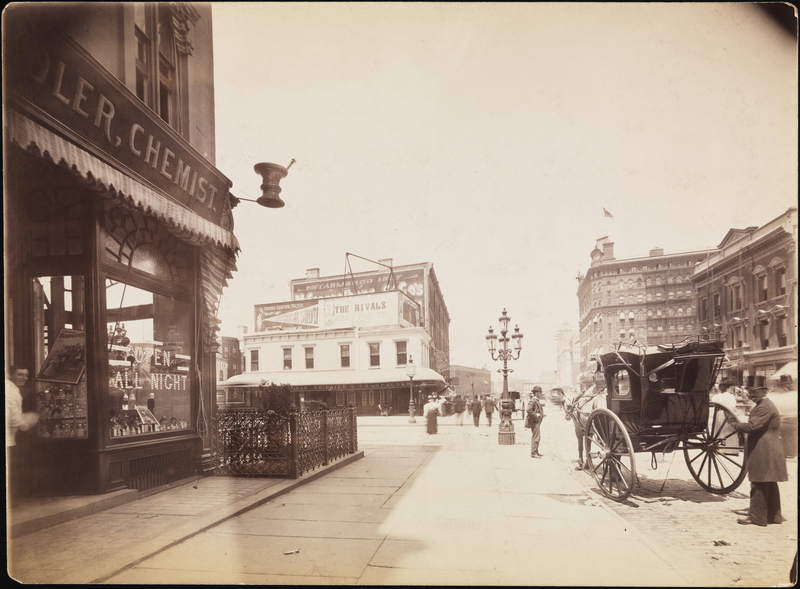 The play debuted on Broadway at the Comedy Theatre as part of an evening of one-acts. The play was successful enough to allow for a 34 week tour giving O’Neill his first steady income as a playwright. 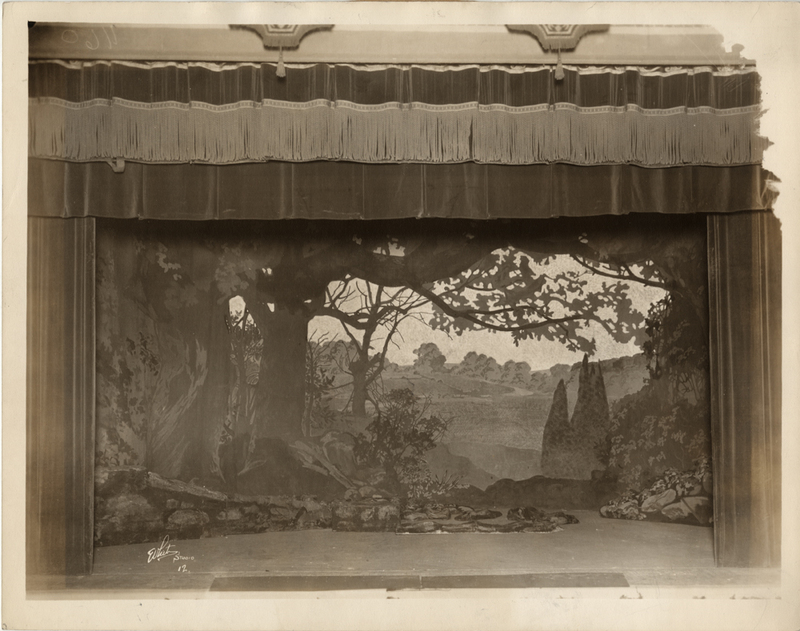 It wasn’t until 1924 that the Provincetown Playhouse put up the first full-scale production of the complete cycle in New York City. By that time O’Neill was an established playwright with a Pulitzer Prize under his belt. In 1920 O’Neill’s Beyond the Horizon earned him his first in what would turn out to be four Pulizters for Drama. 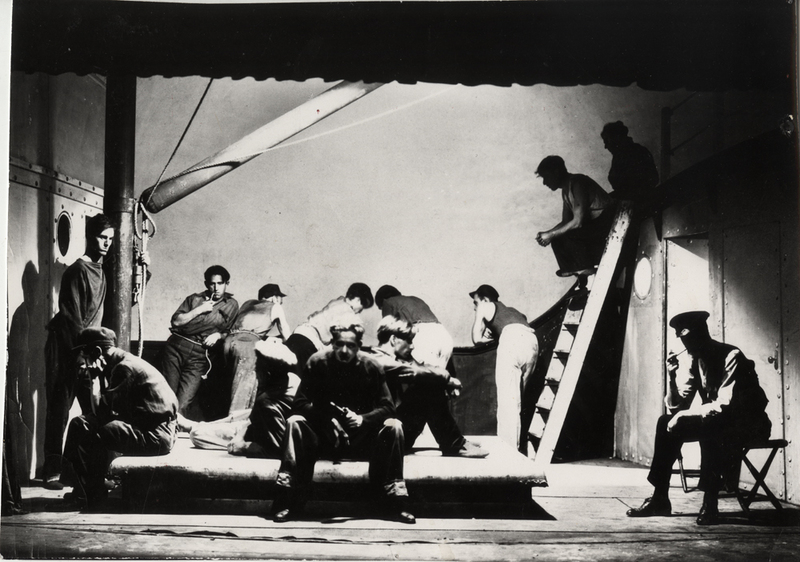 His first full-length work, the play is set in a rural farm community not unlike the one dreamed of by the sailors aboard S.S. Glencairn. The opening scene is a road. 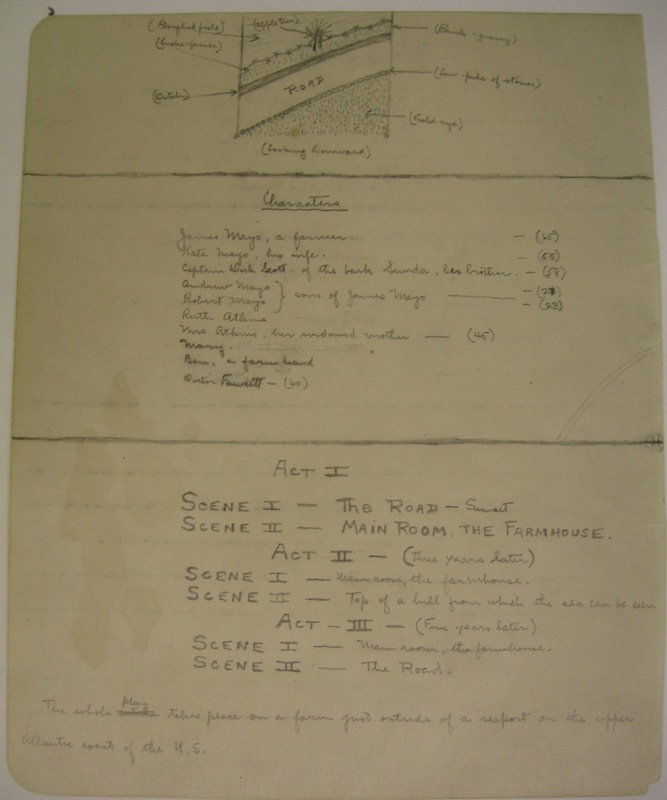 Below is a sketch from a draft page of Beyond the Horizon and the realized scenery at the play’s debut at the Morosco Theatre. The main character, Robert Mayo, is described in the opening stage directions as having “a touch of the poet” about him. He is a dreamer and longs to travel outside what he has known. 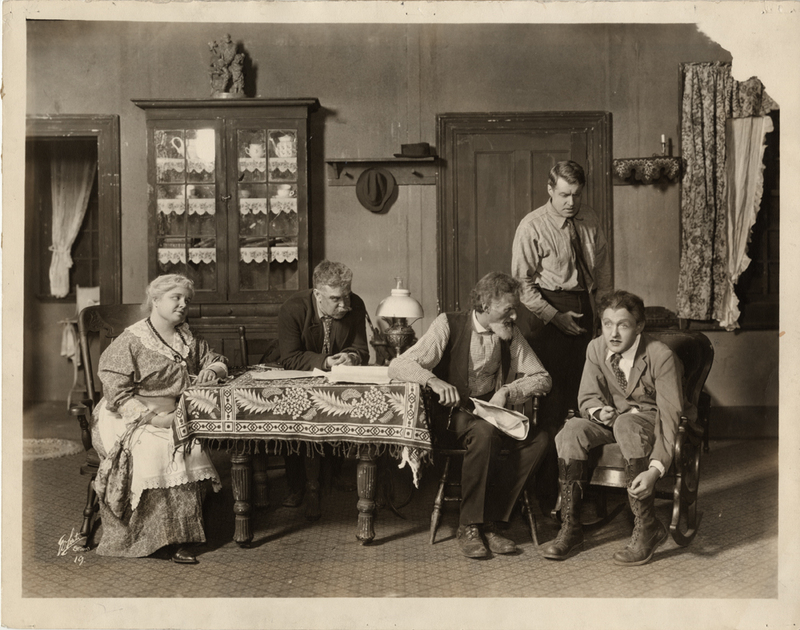 (Robert was portrayed by Richard Bennett, below, seated at far right). Robert’s older brother Andrew is content to work the land, but through the affections of a young woman, the brothers’ fates are reversed. Robert stays on the family farm while Andrew takes to the sea. Neither fares well. Robert ends up contracting tuberculosis. He dies in the final scene as the sun rises up from a disappearing road. Eugene O’Neill’s own end came with a long illness, a neuromuscular disorder that rendered him unable to hold a pen. He died 59 years ago this week at the Sheraton Hotel in Boston, Massachusetts. He was 65 years old. 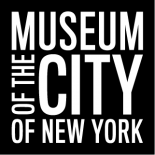 This entry was posted on November 27, 2012 by Morgen Stevens-Garmon in Theater Collection and tagged 1900s, Actors, Broadway, Eugene O'Neill, Theater, Times Square.